We have devised a special package for our Junior Players which includes 400 paintballs, this is plenty to last the day, so parents can keep a tab on spending. We aim to have a total group of between 20 to 30 children who arrive as individuals or in smaller parties of 3-4. This gives them an opportunity to socialise with others their own age and also gives them a valuable lesson in team work and leadership skills. Age range from 8-16 years. The quad biking lasts up to an hour and a half, depending on the groups abilities, and we have several off road routes. They will be fully briefed and supervised with a fully qualified instructor. Age range from 10+. The archery is run as a mini competition to see who the next Robin Hood maybe. You will shoot up to 50 arrows each. between the group, you will shoot upto 25 clays each to see who is the top shot. Group, family and child friendly environment. Quality safety equipment included in all packages. Tons of other activities available at our venue. My son, his friends, and his dad had a great time at his party. Just wanted to say a big thank you. 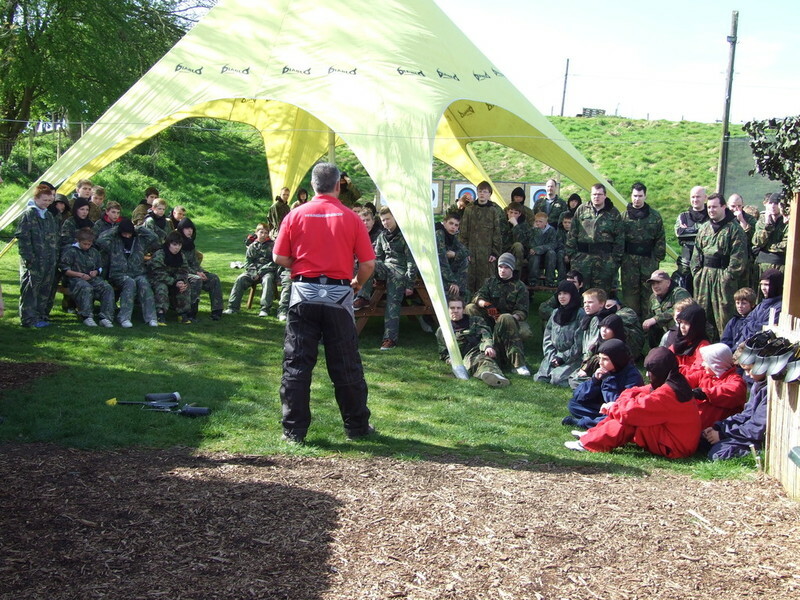 Josh and his friends had a brilliant time playing paintball. They were still talking about it this morning when I dropped him off at school. 2nd time bringing my son and friends (10 years old) for a birthday treat, they absolutely love it. Great day and well organised. Fantastic afternoon, booked for my son's birthday and the event made his day...he and his friends will not forget it easily. We were also very impressed with the staff and their constant help and attention...They get top marks from all !!!!! In all a afternoon thoroughly enjoyed by all...even with the lovely English weather. My two children had a fantastic time, good value, great support from the on site staff. The whole process was slick, professional and did exactly what I needed it to do to ensure we booked exactly what we wanted, turned up in the right place at the right time...and the friendliness of Phil, Kelly and team at the location was superb. An amazing experience for my son and his friends on his Birthday. Thank you from us! My son and his friends had an awesome time and it has inspired a few more paintball parties in the near future! Great fun and very professionally run on the day. Took our four Grandsons on a full days paintballing session, last years Christmas present. They all thoroughly enjoyed it. We thought it was well organised and great value for money. Guess we'll be back! I just wanted to say thanks for organising my son's birthday party so well. They all had a great time (including me!). Excellent equipment, well organised and professionally run. Also, none of the usual rubbish I've had elsewhere where they are trying to milk you for every penny and have games where you cannot die. Great value, great people and would definitely recommend. My son did paintballing with a couple of his friends and my husband, for his birthday. When I booked the junior session I was assured that there would be no all adult or stag parties at the same time, however when they arrived there was a stag party there. The marshals were brilliant though and ensured that the kids were ok. 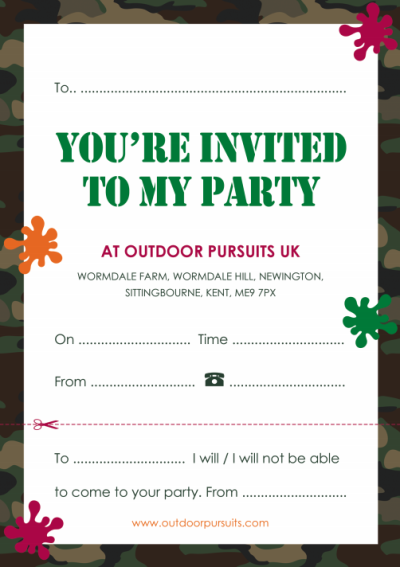 I would thoroughly recommend outdoor pursuits in Sittingbourne and hope to go back to try something else. All the staff were friendly and professional. A great day was had by all!!!! Click to open the PDF to print. ENTER YOUR DETAILS AND WE’LL GET IN TOUCH WITH YOU STRAIGHT AWAY TO ORGANISE YOUR ACTIVITY.